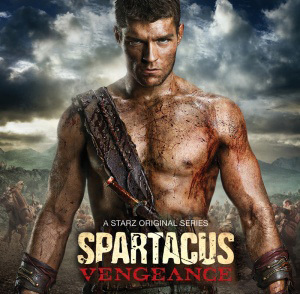 A. Sanders Reviews ‘Spartacus: Vengeance’, Episode 5: Libertus!!! This week’s episode revolved around the rescue of the men captured in the mines during Naevia’s rescue. Unbeknownst to Spartacus, a gladiator whom once graced the sands of the area and fought his way to freedom, has been summoned to make an example of Crixus and the others. A seemingly hopeless rescue made more difficult by the presence of a freed brother of the sands and the secrets of the past he holds. Side notes of the episode held more scheming and plotting from Illithyia and Glaber’s frustration at not being able to apprehend Spartacus. Spartacus and his men discover an old temple inhabited by the lone Roman, Lucius, who is disillusioned with Rome because of war waged years before in which all those he cared for were killed. Spartacus and his people are given shelter and the information that the word on the streets is that Spartacus was defeated in the mines and that 3 of his men are to be put to death on in the arena the next morning. Unwilling to abandon Crixus and the others to their fate, Spartacus forms a daring and borderline suicidal plan to rescue his brothers and show the Romans that he is far from defeated. Gannicus is summoned to Capua to be part of the primus of the games, the execution of the rebel prisoners. He accepts the task because he feels that if his brothers are to be put to death then he will do it and give them an honorable death on the sands. Illithyia and Varnius make their intentions known to her father that they wish to be married. He agrees but tells her she must be rid of her “encumbrance” first. Lucretia convinces Illithyia to hold off on the abortion till after the games as to avoid suspicions. And again pledges herself as a friend to Illithyia. Lucretia, through Asher, reveal Illithyia’s intentions to force a miscarriage to Glaber. Glaber confronts Illithyia and the two have perhaps the most refreshingly honest scene I have ever scene in the series, in whish she tells Glaber that their love and their marriage is over and all they have between them is memories, but even they will fade in time. With the primus of the games as the distraction, Mira begins to set the lower regions of the arena on fire. When the arena begins to collapse Spartacus and Agron attack the remaining gladiators and soldiers, saving Crixus and Oenomaus’ lives. They all manage to escape with Gannicus as the arena burns around them, but not before Spartacus makes an attempt on Glaber’s life by throwing a spear at him. As Glaber makes his way to safety, he comes upon Illithyia’s father trapped under a large heavy beam. Albinius begs for help but Glaber tells him that he is not the fool that his daughter and her father take him for and then proceeds to crush the man’s skull with the beam. Glaber then reunites with his wife and informs her that her father is dead and they will get through it together as husband and wife. Spartacus: was the ever generic hero. I don’t know if it is his writing or the actor but he is a far cry from the tortured hero we first met. He did not really progress much or show signs of ever doing so. Nothing he did this week was a surprise. I keep waiting for him to do something of note or to shock me. I find myself wondering how many different ways he can make a speech about being free and doing the right thing to those that follow him. I get it, he’s the leader he has to hold the group together, but for the love of the Gods, can’t he be interesting and do all that? Where is the Spartacus that planned the massacre of the House of Batiatus? You could feel his fire, you wanted to stand beside him and kill some rich roman (may have just been me…) but you felt it. Who he is now, well I find myself wishing he’d do less talking and more rebelling. Crixus: Not the brutish Gaul we were introduced to any more. Yes he can and will still fight like a berserker, but his loyalty to Naevia speaks volumes. Willing to sacrifice himself to save his beloved. Even while imprisoned, knowing that she is safe gives him the strength to face death with his head held high and in defiance. Glaber: I saw his character grow quite a bit this week. And I found myself cheering him on towards the end of the episode. He showed he is not just the one note antagonist who is trying to capture Spartacus, but he also must fight a battle of a more domestic nature. And while the war may not be over at home, he did strike a major victory against his plotting wife. Illythia: One is left to wonder about Illythia. As a character she has grown from the spoiled rich roman wife we met. She plots and schemes like a champion these days. And she has shown this week she will do what she must to further her ambitions. Even if those ambitions are to be the arm candy of a powerful man. But hey, she will do what she must for that power. Gannicus: Haven’t seen him in a while but he has changed so much. What has he gone through as a free man to come back to us so jaded? Or is it just the guilt of having to kill his brothers? The guilt of past wrongs? The guilt that he is free? His actions show us his internal struggle and give us glimpses into his true feelings. Ultimately I did enjoy watching this episode. It had moments that had me cheering on the villain and really wondering how some of our protagonists were going to survive. The style of the show is as breath taking as always. I love how the blood and gore don’t take center stage yet at the same time are a central part of the story. It is like watching a live action comic book, and yes this is a complement, I love the art in comic books. The story did not drag on and moved towards its purpose. Though I will say that I find the Spartacus character to be lacking. I wish they’d give him more fire and will. It’s like he lost something when he gained his freedom. I find myself wanting to know more about character’s like Crixus, Glaber, or Lucretia. They are still progressing and we are still learning more about who they are and how they respond to things, as opposed to the plateau that is Spartacus’ character development. Again I did enjoy this episode and the series so far has not disappointed. I was left wanting more and am chomping at the bit for next weeks episode. Angi’s Review of ‘The Walking Dead’: Episode 10, Season 2: ’18 Miles Out’!!! This entry was posted on Sunday, February 26th, 2012 at 2:55 pm	and is filed under News, Television. You can follow any responses to this entry through the RSS 2.0 feed. You can skip to the end and leave a response. Pinging is currently not allowed. « Bryan’s Oscar Picks and Wishful Picks!! !